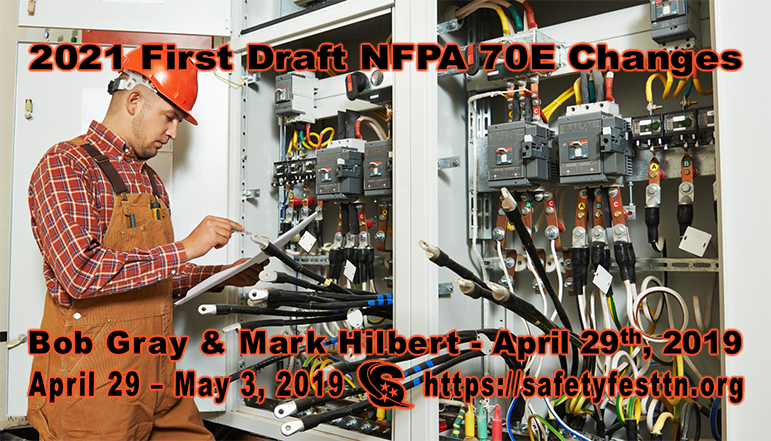 Monday, April 29, 2019 9:00 am, Bob Gray of Hoydar Buck and Mark Hilbert of Hilbert Electrical Solutions will present 2021 First Draft NFPA 70E Changes. All classes, sessions, and demonstrations at Safety Fest TN are free but registration is required to ensure there is enough space. More info below. This presentation which is designed for electrical designers, installer and inspectors provides a summary of the first draft changes to the 2021 Edition of NFPA 70E, Standard for Electrical Safety in the Workplace. Time permitting, there will be an open forum for questions and answers. Bob Gray, Hoydar Buck, Inc. Bob has been an electrical safety consultant since 2007. He is active in the development of NFPA electrical codes and standards and presents seminars for NFPA worldwide. He chairs CMP 18 of the National Electrical Code as well as being a principal member of the technical committees for NFPA 70E and NFPA 79. He also is a principal member of the National Electrical Contractors Association Codes and Standards Committee and the Washington State Electrical Board. He holds an electrical engineering degree and master electrician license. He has worked at DOE sites in multiple management, authority, and consulting roles since 1986. Mark Hilbert, Hilbert Electrical Solutions. Mark was the former Chief Electrical Inspector for the State of New Hampshire and now operates a private electrical inspection and consulting business. He is licensed in three states as a master electrician and a certified electrical inspector by the International Association of Electrical Inspectors where he is a Past President of the Granite State Chapter, the Eastern Section and was the 2014 International President. Mark is the Deputy Electrical AHJ at the Portsmouth Gaseous Diffusion Plant in Piketon, OH and at the Paducah Gaseous Diffusion Plant in Paducah, KY. He is a former member of NEC Code Making Panel 4 and is currently a principle member and Chair of NEC CMP 2 and the NFPA 79 Committee. He is an IAEI and NFPA seminar instructor and has taught the NEC and NFPA 70E domestically and internationally for more than 17 years.